Nobody's perfect, celebrity leaks, toddlers and guns, competitive parents and The Gift Network. That's what caught my attention this week. 1. If you read my blog you know I'm not into celebrity news, but what did catch my attention last week was the story that Nigella Lawson, one of my favourite food and TV personalities, was assaulted by her husband, Charles Saatchi. Photos of him grabbing her throat (in public) hit the tabloids hard last week, ending with Saatchi accepting a police caution on Monday night for assaulting her in front of the restaurant. An article in the Guardian makes the point that she has gone from being the face of domestic bliss to the face of domestic violence overnight. This is the part that caught my attention -- the complete unravelling of the public image she built, the brand, the personality and the picture of a strong-minded, independent woman who had a seemingly perfect life (a domestic goddess, no less) is diminished. People were shocked. I know I was. But we're reminded that nobody is perfect and nobody's life is perfect, no matter how hard people try to make it look that way on Facebook, Pinterest or Instagram. I hope Nigella and her kids are OK.
2. Speaking of celebrity news...rumours of the Kim Kardashian and Kanye West's baby's name have started to leak. At the time of writing, an unconfirmed report suggested that a nurse at the hospital where the baby was born leaked the news that Kaidence Donda West is the full name. That's newsworthy stuff, but it's not what caught my attention. Society's obsession with celebrity news is what always makes me stop and wonder, but Kanye put it so eloquently when he said to reporters, "Like, this is my baby. This isn't America's baby." 3. In more domestic violence news, I read an article recently entitled "Toddlers killed more Americans than terrorists did this year." It's shocking to learn the number of accidental deaths that take place in the U.S. as a result of young children finding guns in the home and playing with them. So far there have been 11 deaths in 2013 (January 1-June 9) where the shooter was three to six years old. There have been four terrorist deaths in the U.S. in that same time frame (Boston Marathon). While the U.S. is doing everything they can to protect its citizens against terrorism, not enough is being done to support gun control. Read on for more incredible statistics. You'll be happy you live in Canada. 4. For parents with kids in competitive sports, I don't need to explain the image above. 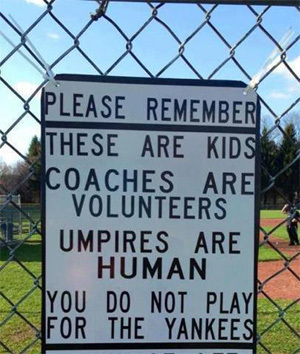 There should be a sign like this in every arena, field, pool, dance hall or area where kids compete. 5. Finally, I thought you might be interested in checking out a new shopping site that SavvyMom has been asked to curate for great mom items. The Gift Network is a one stop online shopping destination that brings together Canada's best independent boutiques. A select group of 'curators' help you find the best in categories from mom gifts and home decor, to tech items and men's fashion. We're the mom curators -- have a look at what we've selected so far.